Meditating on encouragements has opened my heart and mind to many men and women in the bible who encountered discouragements in the lives. These were normal people and their true stories are encouragement to us too that if they overcame their discouraging times, we too can. Today I look at a man by the name of Gideon as told in Judges 6. Gideon’s discouragement is a little different because he felt the Lord was against him and his people. He felt that God had allowed the Midianites to attack them year in year out. He couldn’t turn to God whom he felt was against him. If you read Numbers 31, you will find that the Israelites had very much defeated the Midianites under the leadership of Moses. The Midianites were no march to them. How did it come that the Midianites became a thorn in the flesh unto the Israelites? Vs 1 tells us, “Then the children of Israel did evil in the sight of the Lord. So the Lord delivered them into the hand of the Midian for seven years,” in simple words, the Midianites oppressed Israel as a tool in God’s hands. And if you know what oppression is, it is to inflict distress or dominate harshly. This drove the Israelites hiding in caves, mountains and strongholds. The Midianites would come in year in and year out to destroy their produce and their animals leaving them with no sustenance. In this we are told of Gideon who knew well that the hand of the Lord was driving the Midianites against him and his people and like others, he was hiding, distressed, confused, discouraged with no one to turn to. Vs. “11 Now the Angel of the LORD came and sat under the terebinth tree which was in Ophrah, which belonged to Joash the Abiezrite, while his son Gideon threshed wheat in the winepress, in order to hide it from the Midianites”, looking at the way this verse and others here are presented and punctuated, you find that the Angel of the Lord is identified as the Lord Himself. Either He appeared as an Angel or Gideon would have seen Him as an Angel. Whichever way, the Lord was present with him and watching him struggle threshing wheat in the winepress to hide it. He was used to using oxen to do this kind of job, now he was doing it the hard way by hand, hiding hoping the Midianites would not recognize him or see his stuff. Vs. “12 And the Angel of the LORD appeared to him, and said to him, “The LORD is with you, you mighty man of valor!” How can it be that the Lord would say He is with him when the current situation painted another picture? Not only that, He called him a mighty man of valor? Doesn’t make sense and he challenges it, vs.”13 Gideon said to Him, “O my lord, if the LORD is with us, why then has all this happened to us?” Right now there are people who messed up in some areas and are facing trials and are feeling like the Lord is against them and is out to destroy them. They can’t turn to the Lord because of their shame. They know that Lord is dealing with them but feels like He is against them. Feeling like Gideon hiding under the wine press hoping your enemy will not find you? 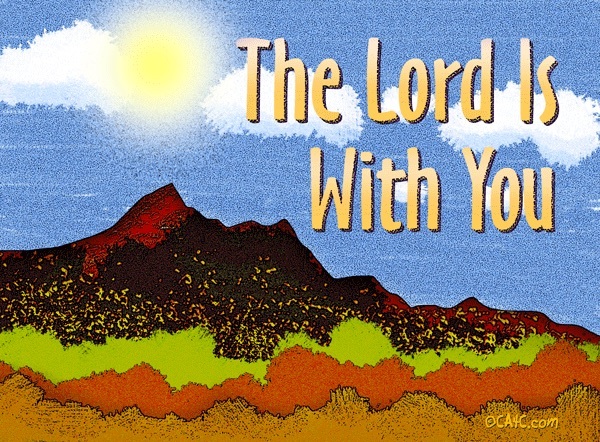 Let this be an encouragement, the Lord is with you and will bring you through. If He was against you, He would have had the enemy destroy you long time ago. The bible says Proverbs 3:12, “For whom the LORD loves He corrects, Just as a father the son in whom he delights”. He has not forsaken the one He corrects. How was the Lord with Gideon anyway? God prevented him from being captured, God gave him wisdom on how to keep something for himself. Even in his discouragement, he wasn’t suicidal. His tribe was the weakest yet the Lord prepared a leader to be. If you feel the Lord is against you, how come you still have life? Are you going without food? Are there enemies driving you out of your home? etc. Yes we have tough times but are we seeing the Lord present even in them for us to be encouraged that He has it all under control? Gideon was wondering whether the Lord was with him because there were no miracles or victories like before. I would say they were very much present but not as he expected them. Not only did the Lord tell him He was with him, He also called him mighty in that when he was done with him he would be one. Job 23:10, “But He knows the way that I take; When He has tested me, I shall come forth as gold”. This entry was posted in All Devos, Encouragement, For Tough Times and tagged Encouragement, For Tough Times.